​On Saturday, Real Madrid host Levante in La Liga as Los Blancos look to get back on track after a run of poor results. Julen Lopetegui's side sit fourth in the league and will expect to return to winning ways after failing to win all of their last four games in all competitions. Eleventh placed Levante, meanwhile, will hope to capitalise on Madrid's recent run of poor form. The preview for the match can be found below. ​Real Madrid, much like ​Barcelona, are going through an unprecedented run of poor form leading into this fixture. Before their much needed international break, Madrid had failed to win - or even score - in four games. These fixtures included a 3-0 away drubbing from Valencia, a draw at home with close rivals ​Atletico Madrid, a Champions League defeat by CSKA Moscow, and then a last gasp 1-0 loss to Alaves. Madrid's last goal came from Marco Asensio in a 1-0 win over Espanyol back on 22 September. Goals were always going to be a tricky to come by when Cristiano Ronaldo left for ​Juventus in the summer, and it seems that the players he left behind in the Spanish capital aren't quite ready to step forward out of his colossal shadow just yet. Levante come into this game in much higher spirits than Real. Sitting 11th in the league, the side from Valencia have won each of their last two La Liga fixtures. They beat Getafe 1-0 away from home and the week before they managed a 2-1 victory over Alaves. They've looked steady this season and might be quietly confident of adding to Real's recent woes. Croatian midfield master Modric has had a wonderful past few years. He came into the 2018/19 season off the back of winning the Champions League with Real and leading his national team to a World Cup final. Rightly named in the best player in Russia in the summer, Modric might even been given the game's greatest individual prize this year, with many tipping him to pip former teammate Cristiano Ronaldo and Barcelona rival Lionel Messi to the coveted Ballon d'Or. But it's smaller league ties such as these where Madrid will need Modric's focus if they want to return to winning ways. Having yet to score this season and only registering one assist, it's fair to say Modric has a slight World Cup hangover, but that's not to say he's been particularly poor by any stretch of the imagination - at times he has still dictated games for Los Blancos. Having featured in all eight of Levante's league matches this season, José Campaña is a crucial member of Paco López's midfield. The former Crystal Palace man will have to work hard to pressure Modric in possession and stop the Croatian finding his rhythm. Ironically, back in 2012, current Real manager Julen Lopetegui won the UEFA European Under-19 Championship with Campaña as his captain. Real Madrid are set to be boosted by the return of Gareth Bale, Isco and Marcelo - all said to be ready and fit to come into the starting lineup this weekend. But Dani Carvajal is still injured. Levante will be unable to use loanee Borja Mayoral as Real are his parent club. On top of this, Armando Sadiku, Coke, and Nikola Vukcevic are all expected to miss the game with injuries. Real Madrid: Courtois; Marcelo, Ramos, Varane, Odriozola; Casemiro, Kroos, Modric; Isco, Benzema, Bale. Levante: Olazabal; Cabaco, Postigo, Pier; Jason, Bardhi, Campaña, Toño; Morales, Boateng, Rochina. Madrid have a lot of class returning from injury issues but those players need to step up immediately. They need goals and they need points. But perhaps more so than the players, the manager seriously needs a win. 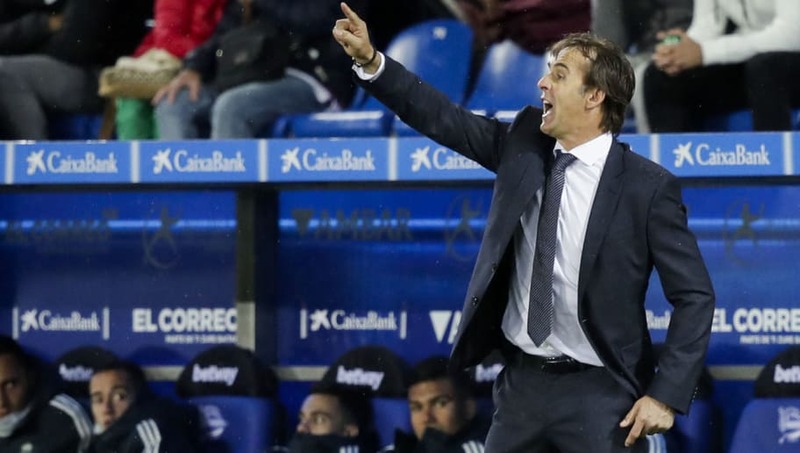 Lopetegui will be desperate to ease the pressure on his job. Levante, on the other hand, come into this game with none of that pressure. If they lose, it won't change much in terms of their season. They might just come away with something from the Bernabeu.